Last week on RAW, Kevin Owens attacked Chris Jericho during the Festival of Friendship. The Arena is dark, and a single spotlight shines on Kevin Owens as he sits on a chair in the center of the ring. He addresses the question of, “why.” Why will he retain the Universal Title against Goldberg? Owens never believed the hype around Goldberg, and he’s never been impressed by him. Owens knows exactly what to expect and what to do. He’ll walk out of Fastlane as champ because he doesn’t have to beat him, he just has to outlast him. He has to outsmart him. He’s going to show everyone that superheroes don’t exist. As for Jericho, Owens says nothing. He drops the mic and leaves the ring. As he leaves, the arena is still dark and no music plays. Quite a good match. Cesaro & Sheamus really dominated this match and looked very good. Good teamwork, and lots of good moves (mostly by Cesaro). Enzo and Cass’s contributions were pretty standard (Enzo got beat up and Cass came in late for the save), but Cesaro & Sheamus did what they could to throw them off their game. One of the best moments was when Enzo dove across the righ for a tag and was met with an uppercut from Cesaro. The finish wasn’t spectacular though, not that it really hurt the match as a whole too much. After the match, Enzo gets on the mic to gloat. While he’s talking to Cesaro, Sheamus boots him in the face. Mick Foley tells Kevin Owens that he can’t leave the arena. He has a match with Sami Zayn tonight. Owens tells Mick that if he isn’t careful, he’ll have more guys on the injured list than in the locker room. Clips of Braun Strowman beating up mostly local talent. Bayley achieved her dream of becoming Women’s Champ last week on RAW. Mick Foley explains to Roman Reigns that he’ll have to wait until Fastlane to fight Strowman. Reigns is okay with that. Anderson and Gallows walk up and say that they have unfinished business with Reigns. Foley tells Reigns to get a partner, but Reigns says he doesn’t need one. Brian Kendrick and Akira Tozawa head to the ring for a match. Clips (from 205 Live) are shown of Tozawa refusing Kendrick’s offer to mentor him. In the ring, Kendrick is furious. During the pre-match handshake, Tozawa refuses to shake Kendrick’s hand. Kendrick clotheslines Tozawa. He then uses the turnbuckle to attack Tozawa’s head and puts him in the Captain’s Hook. Kendrick walks away as the referee attends to Tozawa in the ring. Charly Caruso asks Kendrick about his actions. Kendrick says that no one disrespects Kendrick. Tozawa has a lot of learning to do, and what just happened was the first lesson. Like last week, this wasn’t much of a match. It wasn’t necessarily a beating either. Reigns seemed to have more offense, but it devolved into a brawl after a while. Of course, after the finish Reigns got the advantage and put both Gallows and Anderson down with a Superman Punch and a spear. Earlier today on TMZ, New Day announced that they will be hosting Wrestlemania. Lana introduces “Hardbody” Mahal and “Handsome” Rusev. New Day then comes out and has some news. Woods announces the projects they’re working on and again announces that they will be hosting Wrestlemania. Kofi wants to talk about ice cream. Bo Dallas might have destroyed the blueprints for their ice cream machine last week, but New Day put them back together and went digital with them. Lana, however, has a copy of the plans. This was a fun match. Pretty silly with the whole ice cream plans thing, but I enjoyed it. A tribute to George “The Animal” Steele. In the ring, Austin Aries welcomes everyone to the contract signing for the Cruiserweight Title match at Fastlane. Also in the ring is Jack Gallagher. Aries compliments Gallagher on his talent and skill. Gallagher thanks Aries and signs the contract. Neville then heads to the ring, and he doesn’t look happy. Without a word, he signs the contract and starts to walk away. Gallagher stops Neville and suggests that they share a cup of tea and some biscuits. Neville tells Gallagher that he should be ashamed of himself for playing into stereotypes. He says the fans aren’t laughing with him, they’re laughing at him. And at Fastlane, the only person laughing will be Neville. Gallagher says he’s not playing a gentleman, he is a gentleman. He says that Neville believes he’s a king and therefore better than everyone else. Gallagher won’t stand for that. Neville gets in Gallagher’s face, and Gallagher attacks, sending Neville out of the ring. In the ring, Charly Caruso asks Nia Jax what she thinks about Bayley winning the Women’s Title last week. Nia is upset that she hasn’t received a title shot yet, so she puts the champ on notice. Barack Obama is honored for Black History Month. The new RAW Women’s champ, Bayley, heads to the ring. She talks about growing up in California and chasing her dream. She tries to describe what it felt like when she won the title last week, but she’s at a loss for words. She starts talking about Charlotte when Stephanie McMahon comes out and heads to the ring. Stephanie calls Bayley’s win a “tainted victory.” She questions if Bayley is satisfied with holding a title that she didn’t earn. She suggests that Bayley relinquish the title. Bayley removes the belt from her waist when Sasha Banks heads to the ring. Sasha tells Bayley that she won the title fair and square. She tells Bayley to listen to the fans. Everyone loves Bayley. Meanwhile, Stephanie stirs the pot as hard as she can. Bayley says Stephanie is right… but she refuses to give up the title. Charlotte then comes out to the stage. Charlotte apologizes on behalf of the entire women’s division for Sasha and Bayley. She says she doesn’t want Bayley to give up the title, she’d rather take it from her. Charlotte invokes her rematch clause for Fastlane. Sasha interrupts Charlotte and challenges her to a match tonight. Charlotte accepts. Good match. Charlotte looked particularly vicious with a few of her moves. This felt a bit like an abbreviated version of some of their past matches, meaning it was good and competitive, but a little short. Well, short for one of their matches. Diamond Dallas Page will be inducted into the WWE Hall of Fame. Charly Caruso welcomes Sami Zayn. She asks him if he wants to tell Jericho “I told you so.” Sami isn’t happy about Jericho getting turned on by Owens. He also says that Samoa Joe is a lot like Kevin Owens, and eventually, time will catch up with them. Kevin Owens heads to the ring for his match with Sami Zayn. Zayn comes out next, but he is attacked by Samoa Joe before he can make it to the ring. Joe destroys Zayn at ringside while Owens watches. After a senton on the floor, Joe tosses Zayn into the ring. Referee Rod Zapata tends to Zayn and tells him the match is off, but Zayn insists that he ring the bell. This wasn’t a match, it was a beating. Zayn was nearly unconscious after Joe’s attack, and Owens was able to have his way with him. Stephanie asks Foley where he was while she was getting insulted by Sasha and Bayley. Foley says she put herself in that position, and he enjoyed watching it. Steph accuses Foley of insubordination. Foley responds by telling Steph not to treat him like he’s stupid. He refuses to let Steph’s greed get in the way what he knows is right. Steph warns Foley to be careful. Se wouldn’t want him to have an accident. Michael Cole has a sit-down interview with Brock Lesnar and Paul Heyman. Heyman interrupts Cole and tells him to watch his tone. Heyman says that he thinks Kevin Owens has a chance at beating Goldberg, but Lesnar disagrees. If Goldberg hits a spear and jackhammer, then he’ll go to Wrestlemania as the champ. And at Wrestlemania, Brock Lesnar with take that title. Good match. It was probably better than it should have been. I give Big Show a lot of credit in this one. He did everything he could to make Strowman look good. There was one awkward moment where Strowman struggled to go go under Big Show and lift him for a powerslam, but other then that the match was pretty decent. Slow, obviously, but for a match between two giants it was good. I didn’t like that they teased a superplex but never paid it off. Don’t tease it if you’re not going to do it. After the match, Roman Reigns heads to the ring. He attacks Strowman, hitting him with two Superman punches before taking a dropkick. Strowman then hits Reigns with a running powerslam. There was a lot of stuff on this show, but not a lot of it felt terribly important. 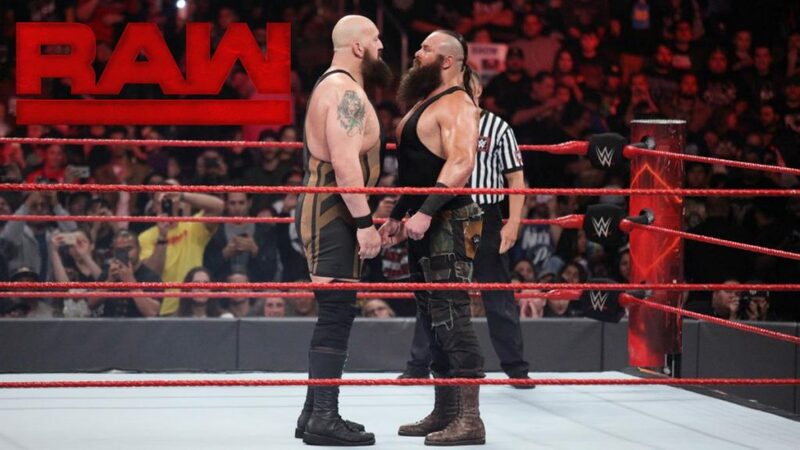 It felt like a lot of “more of the same.” There was a rematch from last week, another beating by by Joe, another squash for Nia, another Sasha/Charlotte match, a pretty typical contract signing, more ice cream shenanigans from New Day… and the main event, even though it was okay and did a lot for Strowman’s credibility, felt like it was detached from the rest of the show. Not the best RAW. The main event definitely felt more important, but I doubt I’ll ever watch it again. This tag match had a lot of great elements, and the action was a ton of fun to watch.